Tanning beds are equipped with acrylic sheets. These are designed to allow UV rays to penetrate your body, while protecting your tanning bed bulbs. Acrylic sheeting requires careful cleaning and inspection to prevent cracking. When cracks do occur there are no gels or glues that will successfully fix the cracks. To repair acrylic cracks and nicks, full acrylic replacement is required, to prevent injury and extend the life of your tanning bed. Position your tanning bed in an upright position, ensuring all power cords are unplugged from the electrical source. This eliminates the risk of electrocution. Make sure that your tanning bed canopy is fully opened, to allow you ample space to work, without risk of injury to you or the bed. Locate the bed profiles that hold your acrylic in place. These are made of pliable materials, and form a hinge over your acrylic, running the entire length of the tanning bed. Pull up at the middle of the open side, to release your acrylic. Some beds contain two sets of profiles for additional stability, therefore you may be required to repeat the release process, on these additional profiles. Grasp your acrylic by the outer edge nearest you. Avoid sharp edges, as they pose a cutting risk. With the outer edge firmly in your hands, carefully slide the acrylic towards you, releasing it from the inner profiles. Set your damaged acrylic against a wall, out of your working space. Firmly grasp your new acrylic by the outer edge, as you did for removal of the old one. Position your new acrylic to line-up perfectly with the inner profiles of your tanning bed -- and carefully slide it into place. Press gently on the new acrylic, around the profiles to secure. You will hear and feel a soft click, letting you know that the acrylic has been positioned properly. Follow installation with a thorough cleaning, using a non-alcohol based cleanser specifically formulated for acrylic surfaces. 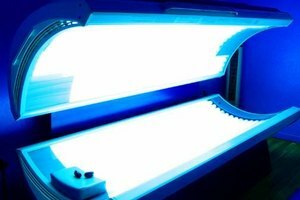 How Much Weight Can a Tanning Bed Hold? How Much Room to Allow for Home Tanning Bed?